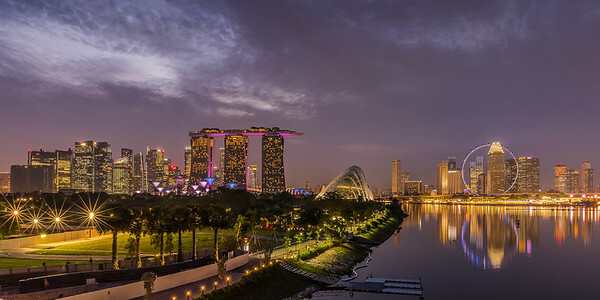 Marina Bay district of Singapore. During my long stay in Indonesia I had to leave the country twice during my visit. 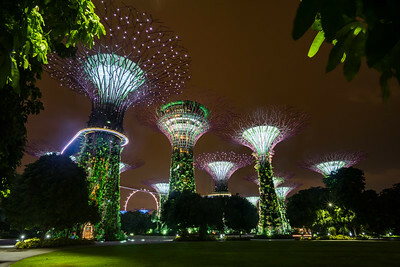 I had spent a week before, years ago, in Singapore and visited the main highlights. This time I wanted to spend my 3 days trying to shoot enough footage for a time lapse movie. The first 3 images are blends of all (up to 900) images of the timelapse, blending time and light into something 'new'. Some are single shot frames from the timelapse. I luckily visited the city when temperature was more bearable than last time and really enjoyed going around this gorgeous city. I stuck to this Marina Bay area, which is the most scenic part of the city. Merlion statue at the Marina Bay district, Singapore, Asia. 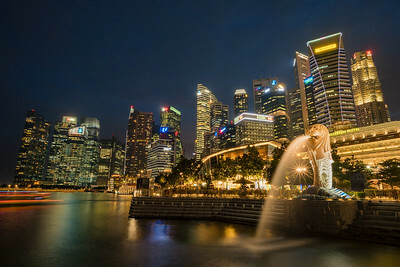 This well-known marketing icon of Singapore is depicted as a mythical creature with a lion's head and the body of a fish. It is used as a mascot and national personification of Singapore. As you can see by the blue sky, this shot was taken right after sunset during the so called 'blue hour', in which the sky gets a really nice blue color. After this blue hour, the sky gets a real yellow color, thanks to the huge amount of light polution in this 'city of light'. 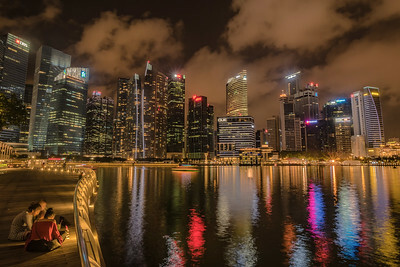 Marina Bay district, Singapore, Asia. Left is the insane-looking helix bridge, the Marina Bay Sands hotel, the crazy design of the ArtScience museum and the business district in the back. This image is shot on one of the platforms at the side of the bridge which give you a great view of the city. 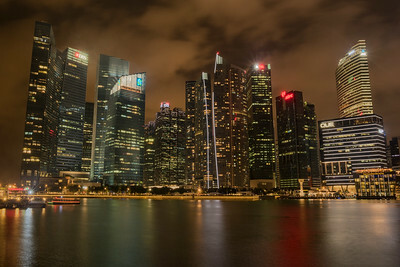 Skyline of the business district at Marina Bay, Singapore, Asia. 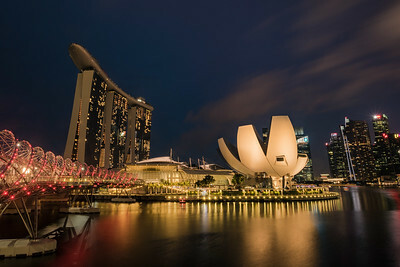 The area in front of the Marina Bay sands hotel offers great views on this part of the skyline and is a great area to rest and enjoy the view and people walking by. It's also here where you'll find the twice-daily water & light show. 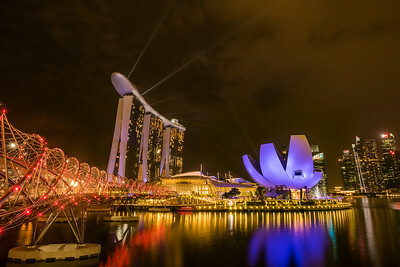 Marina Bay Sands hotel and ArtScience museum at the Marina Bay area, Singapore, Asia. Twice a day, at 8 and 9pm starts the 15 minute water & light show. Not just any show, a serious spectacle for the eyes and ears. 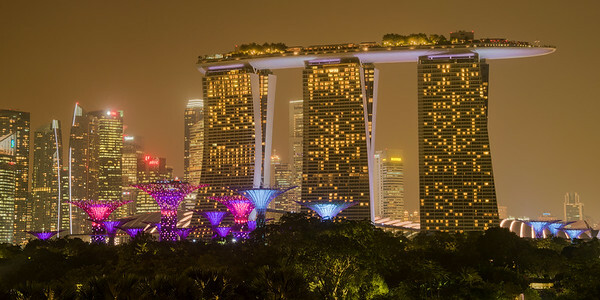 During this show, the lasers on the Marina Bay Sands hotel will do their thing. Make sure you're prepared and all set up if you want to capture them, but make sure you watch the show up close as well. The water show at Marina Bay, Singapore. This image is a blend of several long exposures. My aim here wasn't to to capture a moment as it occorred, but rather to create a feeling of the show. A single moment doesn't do it justice, as there is so much going on in such a quick pace. The show is said to be one of the most advanced water & light shows in the world, and it is amazing. 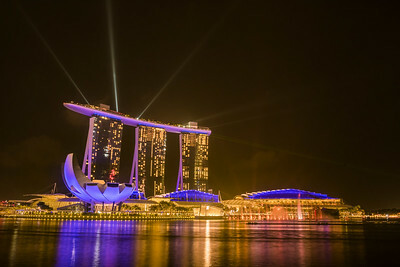 The 15 minute show plays at 8 and 9pm daily, right in front of the Marina Bay Sands hotel. Botanic Garden at Marina Bay district, Singapore, Asia. 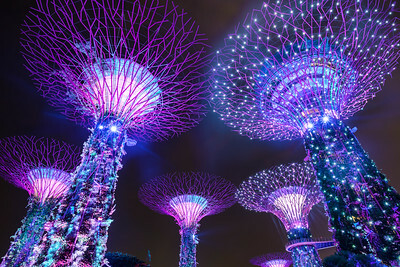 This surreal park has some of the coolest trees you'll ever see. Decorated with countless lights, the park is best visited at night, especially during the free 15 minute light shows at 7.45pm and 8.45pm. 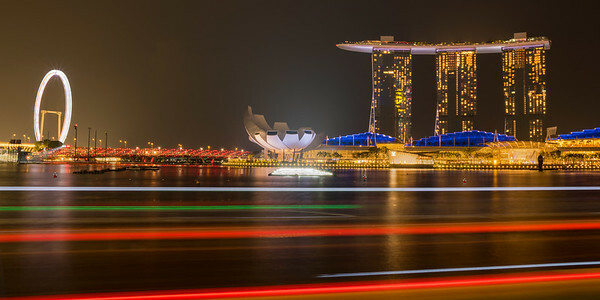 Marina Bay Sands hotel and the ArtScience museum, as seen from the Merlion statue. I played around trying to capture the light trails of the boats passing by and ended up blending several exposures for a better effect and to make the ferris wheel look as if it's spinning fast. The light trails really helped create an interesting foreground, without it the shot was just too 'empty'. Marina Bay Sands Hotel and the Botanic Garden, seen from the Marina Barrage in Singapore. This 8 billion dollar hotel has 2561 rooms and the largest casino in the world, among endless other things. Stay there to enjoy the incredible view while swimming in their amazing infinity pool. Wish I had..
Singapore skyline as seen from Marina Barrage. Between both locations in a nice walk through the park and the Botanic garden, a nice retreat from the buildings and great place to chill for a bit in this warm city. Watching the sunset from this location and enjoying the light show at the gardens was a perfect way to end the day.